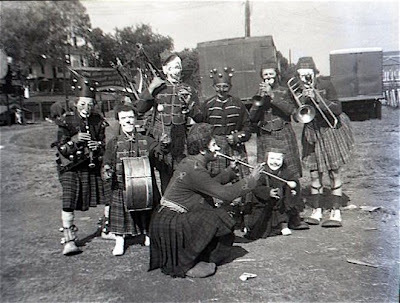 It looks to me like Gene Randow down in front, the two little people are the Dewsberrys, the Georgetti Brothers have the bells on, The whiteface in the middle is Dennis Stevens, the tramp to the right of him is Dime Wilson and the whiteface at the far right it looks to be Ed Raymond. 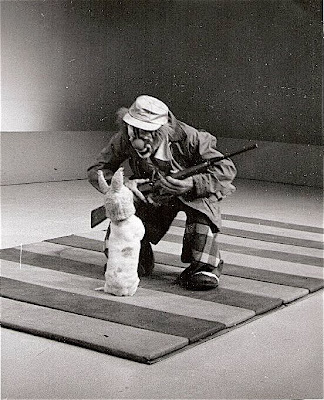 All the way back to "Sam and Friends", the Muppets have been responsible for some really great clowning. Believe the hype, folks... because it's all true. I was born shortly before the Batman TV series entered it's third and final year on ABC. I grew up with it running in constant syndication on WPIX channel 11 from New York. I taught myself to read by reading Batman comic books and collected them religiously well past the age that I probably should have. I had to live through two pretty interesting movies from Tim Burton and two awful movies from Joel Schumacher before finally getting Batman Begins from Christopher Nolan. I've spent the last 40 years with these characters. The Dark Knight is, easily, the best Batman movie of all time. It is also, far and away, the best superhero movie of all time. It's not just a "summer blockbuster". It's a really good film; Silence of the Lambs/Goodfellas/Godfather 2 kind of good. 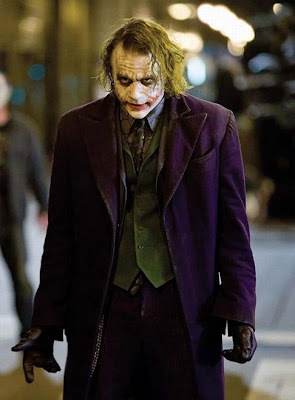 Heath Ledger's brilliant performance as the Joker merits clownalley.net's first ever "scary clown" image. 20 more copies of the first volume of the official CLOWNALLEY.NET compilation DVD are being burned on Monday and will be ready to ship on July 25th. Please click the title of this post to be taken to the eBay "Buy It Now" auction page. This is a five day auction only and no more copies will be printed until Volume Two in the series becomes available this fall. 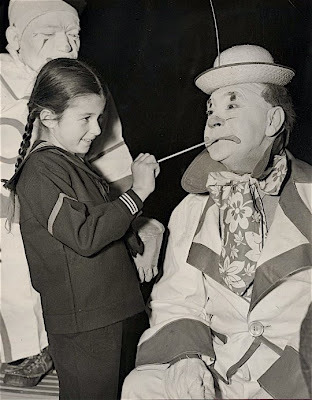 These were taken during the taping of a 1971 television special about the Ringling Bros. and Barnum & Bailey Clown College. 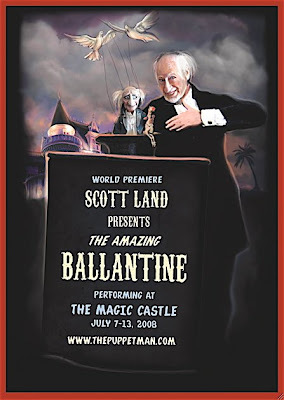 The show aired on WFLA Television in Tampa, FL. 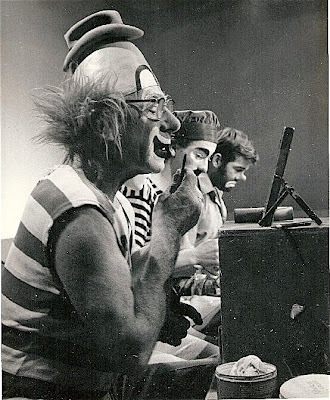 The other two clowns look to be Clown College grads Johnny Peers and Jim Howle. Jojo Lewis, Paul Jung and Paul Jerome. Teatro ZinZanni is a three-hour whirlwind of circus, comedy and cabaret featuring an international cast. 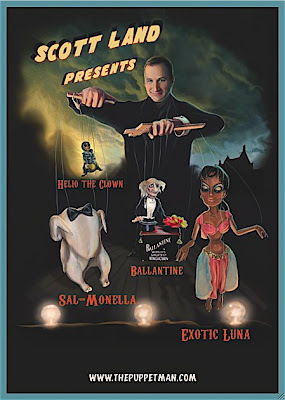 The show, which includes a five-course feast, opened in Seattle in 1998 and is now running concurrently there and on San Francisco's Embarcadero. 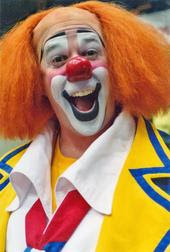 The cast in Seattle includes Clown College grad Peter Pitofsky. The San Francisco cast now has Groucho impersonator extraordinaire Frank Ferrante as "Chef Caesar". 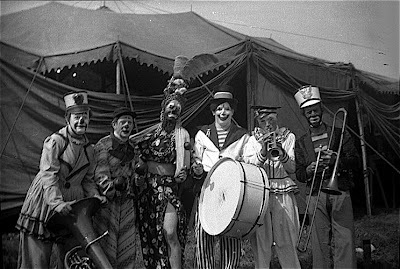 The Eotvos family of musical clowns as they appeared in Feld Entertainment's first attepmt at a one-ring venture, Festival International du Cirque de Monte Carlo Spectacular that toured the U.S.A. in 1979. 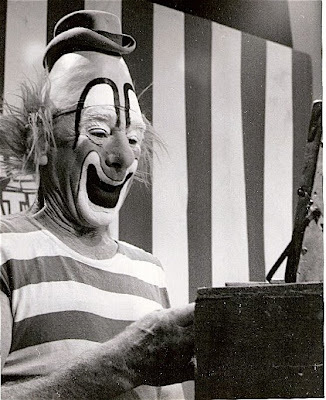 George Footit, a circus artist (white clown, rider and acrobat) and actor born in Manchester in 1864, deceased in Paris in 1921. 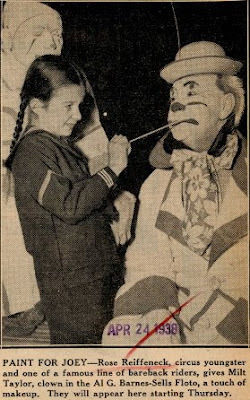 Son of George Footit and Sarah Crockett, both circus artists, he began its career at the age of twelve. 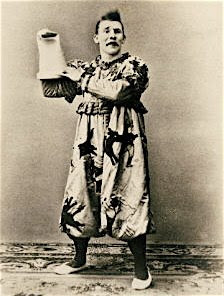 He worked for Sangers' Circus of London, which came to France in 1880. In 1886, Footit teamed for the first time with Chocolat at Medrano. They then appeared with l' Hippodrome de le Champ de Mars, then with the Cirque Nouvelle de Paris. 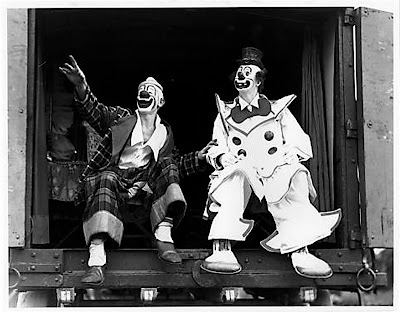 During their long career, they perfected the comic duet between an authoritative white clown and an Auguste scapegoat. The expression “I am Chocolat” was popularized by the dialogue of their entrees. Their career reached it's apogee in 1905 but they had separated by 1910 so that Footit might work with his sons. His career in the ring was never again to know the heights that it had reached with Chocolat. 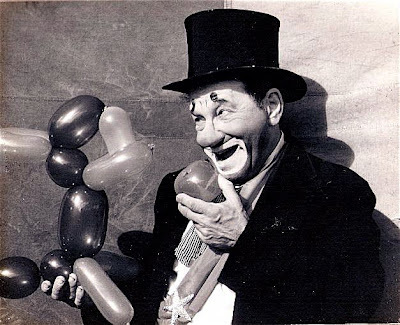 Footit later launched his own circus, then owned a bar, in Montaigne in Paris. 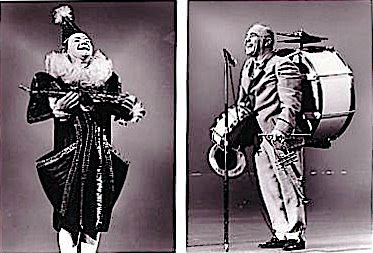 Lou Jacobs and Paul Jerome in grotesque whiteface in the late 20s/early 30s. 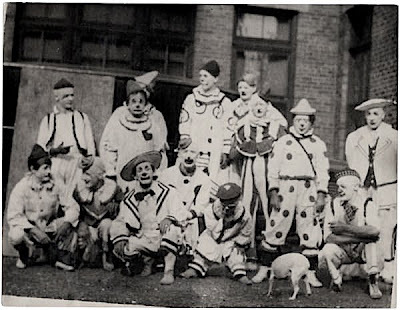 Unknown clowns, unknown show, no date. 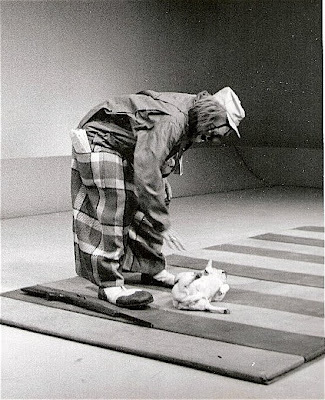 Dean "Elmo Gibb" Chambers performing his contemporary update of Professor Charlie Cheer's classic comedy rope trick. 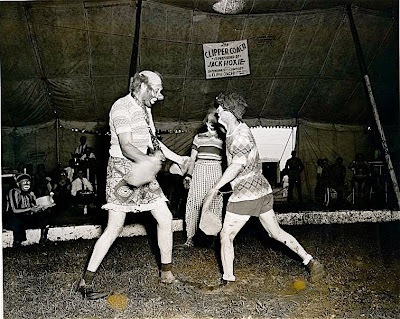 Here he is in a photo that I believe was taken in the early 60's on E.K.Fernandez in Hawaii. 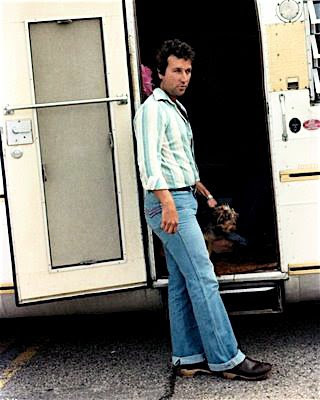 I suspect that Charlie, as evidenced by the dirty fingernails, may also have been the show's mechanic. 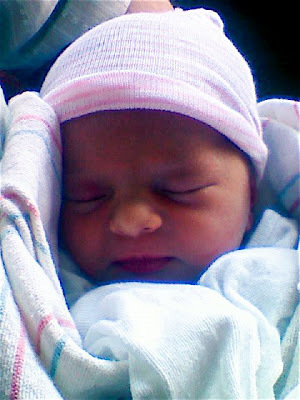 She's a lucky little lady who shares her birthday with the atomic bomb, first detonated in Los Alamos, NM July 15, 1945. J. Robert Oppenheimer, scientific director of the Manhattan Project, was under no illusions about what he and his fellow physicists had wrought. The effects of the blast, the equivalent of 20,000 tons of TNT, moved the intellectual Oppenheimer to quote from the Bhagavad Gita: "If the radiance of a thousand suns were to burst at once into the sky, that would be like the splendor of the mighty one. Now I am become Death, destroyer of worlds." She's only a few hours old and already she's got the kind of mad, phat goth cred that burns brighter and more intensely than 1,000 "Hot Topic" gift certificates. 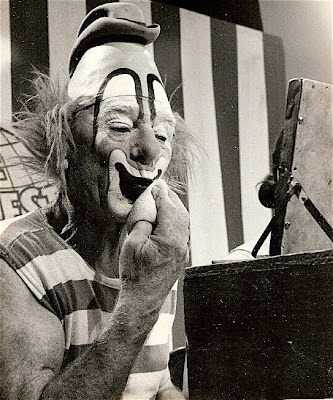 Robert "Onionhead" Dunn in his dressing room on the Universoul Circus. 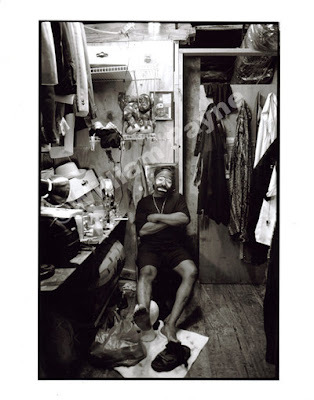 For more of Bill Payne's photos, please click here. Neil Cockerline identifies them (L to R) as: Elmer Lingquist, Phil Keeler, Ernie Burch, Johnny White, one of the Hodginis, & Dime Wilson. Excerpts from Cirque d'Hiver Bouglione de Paris' 2006/07 production "Artistes" featuring Fumagalli and Daris. Our deepest sympathy goes out to Mr. Drougett's family. His grandfather, Michael "Coco" Polakovs, is headed down to Sarasota to attend the services. 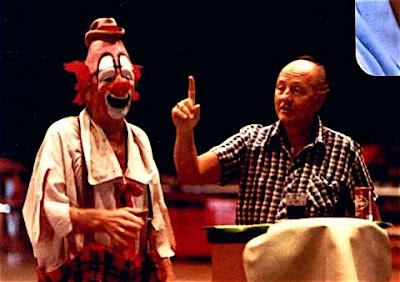 Lou Jacobs and Glen "Frosty" Little teaching at the Ringling Bros. and Barnum & Bailey Clown College at the old Winter Quarters in Venice, FL. 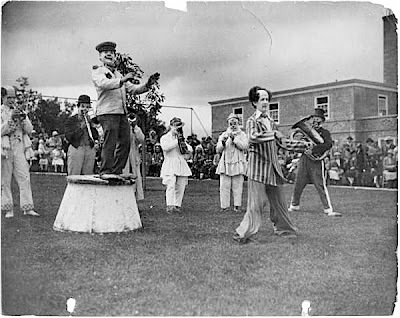 Clowns from the Al g> Barnes Circus performing for the Children Hospital, Halifax, Novia Scotia, Canada. Excerpts from Cirque d'Hiver Bouglione de Paris 2005/06 production Audace. 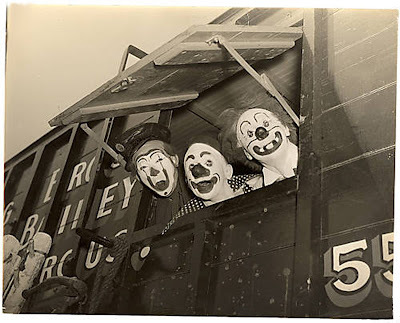 Because Steve Smith is absolutely right, "Clowning really is snow on Christmas and all day suckers and Never-Never Land..."
This is clownalley.net's 2,000th post.